New Centrist remembers the Triangle Shirtwaist fire in Greenwich Village, whose 98th anniversary it is. She joined the Communist Party, and like many radicals of her generation was compromised by her links to Stalinist terror, particularly during the Spanish Revolution/Civil War where she worked alongside her lover Vittorio Vidali, a notorious henchman implicated in the death of many Poumistas, trotskyists and anarchists (including Alberto Besouchet, the first Brazilian to join the International Brigades, who disappeared after being denounced for Trotskyist sympathies – the evidence against him including an association with the Brazilian singer Elsie Houston, ex-wife of the surrealist Benjamin Peret who we have mentioned here before). 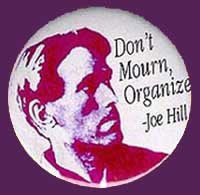 Joe Hill was, it appears, something of a dab hand at cooking Chinese meals and using chopsticks. In fact, there’s a whole chapter in Franklin Rosemont’s study Joe Hill, the IWW and the Making of a Revolutionary Working Class Counter-Culture, on what might be called the Chinese restaurant factor. This was at a time when America was in the grip of ‘Yellow Peril’ racism, none more so than that emanating from what the Wobs called the American Fakeration of Labour. [a democratically elected Spanish government] which brutally massacred many workers and tried to turn back the revolution, yes. Or because it was democratically elected, therefore it must be politically supported? And how did this government end, exactly? With the victory of Franco? Why? Because its politics disarmed the defence against fascism, the working class, and its defence of private property led to huge economic speculation which caused great inflation, which discontented so many of its supporters, that the fascists became more confident and more popular. *Liberty taken of improving the grammar slightly. Sparked by Terry Glavin’s post linked to here, the Fat Man gives his thoughts on George Orwell.